Oy Vey! Now I'm in trouble with the FBI too! oh no! i'm in trouble with the CIA! I received your postcard today inviting me to re-join the U.S.C.F., and would very much like to be a member again. I resigned when the U.S.C.F. chose to require competition players to submit to suspicionless drug testing. Has the U.S.C.F. re-considered this bizarre, ridiculous, vile, offensive, insulting, un-American and unconstitutional violation of players' rights? I will be happy to re-join the U.S.C.F. when it has ceased to become a willing stooge and whore for the racist gulag War on Drugs, which has made the Land of the Free the world's largest prison, currently with about 2.3 million children, women and men behind bars. Chess, of course, has always been a popular pastime among prisoners, but I do not feel it is appropriate for America's most prestigious chess organization to help the government fill our prisons with chessplayers. I wish to play chess in an American, Constitutional environment which respects the Bill of Rights and the protections it affords all American citizens. I wish to belong to a national chess organization which does not assume its players are probably all criminals and druggies. Please let me know the U.S.C.F. 's current position on coerced suspicionless drug testing, and I will let you know if I can feel comfortable adding my name and paying money to the U.S.C.F. .........and if you would change to playing chess by letters or online ? 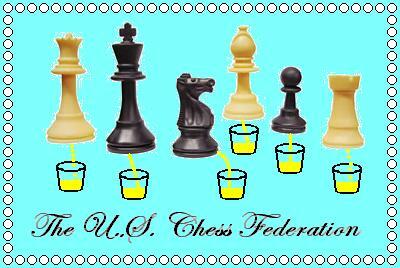 You'll keep us posted of any response you get from USCF, if any...?